Camping La Noria är en camping i Torredembarra, Tarragona, belägen vid havet. Campingen har platser med stängsel, med skugga och platser med lite skugga. Camping La Noria ligger i närheten av en sandstrand. Det finns möjlighet att hyra husvagnar, husbilar och bungalows. På campingen finns en lekplats och ett sportområde. För den sportige semestervandraren har campingen olika cykelleder. Det finns ett underhållning. I den närliggande omgivningen kan du också simma i havet. I Camping La Noria är det tillåtet att snorkla och vindsurfa. Denna inspektör gör varje år ett besök på Camping La Noria och inspekterar campingen för ca 200 faciliteter och för andra förekommande punkter. Inspektören är en medarbetare från ACSI och arbetar inte för campingen. Excellent location - short walk to the long sandy beach. Large pitches with shade. Very relaxed, stayed for several days in September. We came planning to stay for two weeks and ended up staying for 30nights. What a great campsite staffed by very friendly and helpful staff. The campsite has direct access to a wonderful sandy beach that you can walk north on for 6KLMS and south into Torredembarra and the bars and restaurants. The rail line at the end of the campsite is very busy but even though I\'m a very light sleeper was not a problem. The toilets and showers are kept immaculately clean by a lovely Moroccan lady. The only down side was the number of wood pigeons that continually dropped faeces all over the car, caravan and awning. All in all we will return here next year. This is a summer review! We came back to Spain and to La Noria for want of better weather in England! We were somewhat hesitant about returning in High Season but our worries were unfounded. We again received a wonderful welcome and have found friendliness throughout our stay. (We have been here for 10 nights but must set off back to the UK in the next day or so.) The restaurant menu and quality of food and service remains excellent, as does the selection of goods in the campsite mini-market. There has been no increases in prices to take advantage of holiday-makers, as so often happens in England. The grounds and toilet facilities continue to be well maintained. Although we shall be paying the High Season price per night, offset against this is the free WiFi which for the most part is excellent and reliable. Oddly, there seem to be many more camping places available in the tourist section. However, with the Spanish now enjoying their vacations, the beach is very full, almost from morning to night and the shops, bars and restaurants are busier. We are delighted with the experience we have had and give La Noria top marks again! We have spent 3 weeks on this site and will be very sad to leave. It was not our intention to come to Spain but the weather in southern France had not been very good ~ we chose La Noria purely by chance, thinking maybe of staying 2 to 3 days. The welcome was overwhelmingly friendly and throughout our stay the office staff, management team, ground staff, supermarket & restaurant staff etc etc have all been delightful. The toilets and showers, food & clothe washing areas are kept immaculately clean constantly throughout the day. The mini supermarket offers a good range of food supplies and the bread - baked on the premises - is superb. The restaurant (and bar) has an extensive menu but also offers a daily 3 course meal + a choice of drink for just 10.5 euros ~ the quality, quantity and service are all excellent. The lovely sandy beach is accessed via a tunnel under the railway ~ a very easy 5 minute walk. The nearby lovely historic town of Torredembarra is an easy half hour walk ...and there is a Carrefour supermarket abut 10 minutes' walk away. All these plusses made up for the downside of the busy railway line. We will certainly come again and will try to stay a bit longer! Very highly recommended. We give a score of 9+. Vill du boka campingen Camping La Noria eller få mera information? Det går bra med nedanstående uppgifter eller via campingens webbsida. 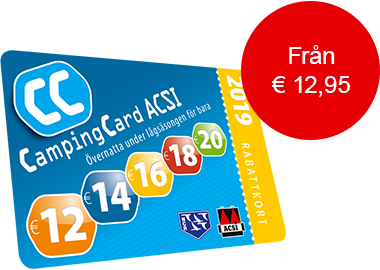 ACSI Eurocampings skickar din informationsförfrågan till "Camping La Noria".